The statue of Thomas Watson, a Georgia United States Senator in 1920, is being removed from the grounds of the Georgia State Capitol. 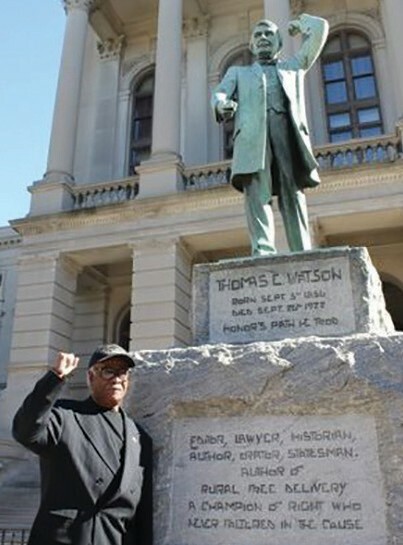 “Several years ago, I met a young photojournalist from Creative Loafing, Joeff Davis, who was dedicated to the removal of the statue of Thomas Watson from the grounds of the Georgia Capitol because of Watson’s racist reputation,” said Representative Tyrone Brooks. “This was his idea and I have been privileged to have worked with him to make this a reality,” Brooks added. The former U.S. Senator, author, newspaper man, and a self-described white supremacist, Thomas Watson, is being moved from the Georgia State Capitol as a part of a construction program. Governor Nathan Deal issued an executive order that allows crews to move the 12-foot-tall statue to Plaza Park, a fenced-off, stateowned park across the street. Davis was instrumental in starting a petition campaign which resulted in getting the attention of the Georgia Governor. Deal acted to remove the Watson statue which was reported to be offensive to many Georgia citizens. The ADL, Brooks, and many other concerned Georgia civil rights groups are grateful to Deal for his timely actions. “We are elated by the proposed removal of the Tom Watson statue and we would like to see the statues of Sen. Richard Russell, Gov. Eugene Talmadge, and Confederate General John B. Gordon also removed from the State Capitol, as well as all the other statues which we consider offensive,” said Representative Brooks. “I link the removal of the Watson statue to the victory in the removal of the 1956 Georgia State Flag. But this is not the end of the situation or the problem. We must continue to petition the Governor and other state leaders that these old racist artifacts must be not only removed from the grounds of the Georgia State Capitol, but replaced by African American, Native American, and Asian American monuments which represent the Georgia of today,” stated Brooks.